The IC-2820H receives 118-549.995 and 810- 999.990MHz* with dualwatch receiver capability that allows you to receive two bands simultaneously (including within a single band)*. Almost all VHF& UHF communications are available to you! If you have two antennas, diversity receive* capability is useful for mobile operation where the received signal strength changes continuously. Within a single band, the radio compares signal strength from each antenna and chooses the better signal to maintain good sound and receive quality. * Available on 127, 136, 146, 375, 440, 500MHz bands in FM, FM-N, DV mode only. The large 93 × 28 mm (321/32 × 13/32 in) full dot matrix display presents an easy-to-read graphical interface, viewable over a wide angle. Push the "Function" button to call up the assigned functions menu on the display. In addition, tuning knobs and buttons for each band are arranged side-by-side, providing intuitive operation. The controller is separated from the main unit for flexible installation. The controller has magnets on the rear panel, allowing you to attach the controller to the main unit or other metal objects. This makes clean and neat installation easy! A 3.4m separation cable, OPC-1663, and a short cable (10cm), OPC-1712, are included. The IC-2820H has a total of 522 memory channels, 500 regular channels, 2 call channels and 20 scan edge channels. Each memory channel stores tone frequency, skip information and so on. The Dynamic Memory Scan (DMS) system divides these memories into 26 groups, A to Z, and provides easy channel selection. Of course, bank scanning is also possible. The band scope function lets you watch conditions near the receiving frequency and visually assists in finding other stations. The UT-123 provides D-STAR DV mode operation plus GPS receiver capability. Your location information can be sent simultaneously with the digital voice transmission. The IC-2820H sends your location information either when the mic PTT switch is pushed, or at a preset interval (5 seconds - 30 minutes). When available from a calling station, the IC-2820H displays the distance and direction to the station. The GPS alarm alerts you by beeping when a preprogrammed point is within 500m or 1km range from your location or anyone of preprogrammed points is within a preset square range. When connected to a PC* via the optional RS-232C cable, OPC-1529R, your own or the received location information can be plotted by map software* on a PC. * Serial port and map software (NMEA 0183) are required. The one-touch reply function makes it easy to respond to a calling station instantly. In addition, up to 20 received callsigns are automatically stored as received call records. The built-in voice recorder* records an incoming call for up to 30-seconds (approx. ), (or 15 sec. × 2 tracks, 10 sec. × 3 tracks). The 10 sec. transmit memory allows you to record your callsign or other message, and also automatically answers when you receive a message. OPC-1529R, the data communication is available simultaneously with a digital voice transmission. * Serial port and serial communication software are required. 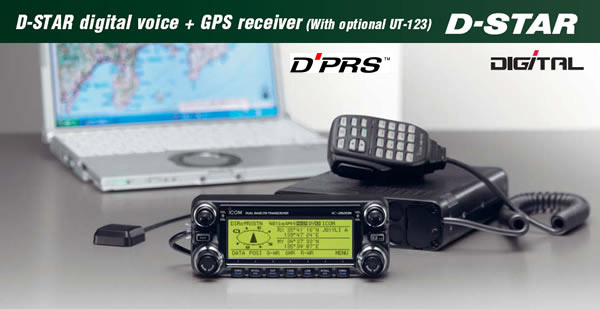 D-STAR repeaters for 144 and 440MHz are now available, allowing cross-band (144/440/1200 MHz) operation and long distance communication via the Internet over the D-STAR system.